We can’t avoid the fact that how badly we need a comparatively good CPU for our work and daily routines. It plays a significant role in making our lives easier by working fast and accurate. We tend to expect too much from this simple machine and also pamper it so that it doesn’t cool its temper! Okay, jokes apart and coming to the point; I am talking about the Thermal Paste, which helps the CPU to cool down properly. Most of you – the computer geeks – know how to apply thermal paste to CPU! So, I am not going to talk about it by repeating that simple method. 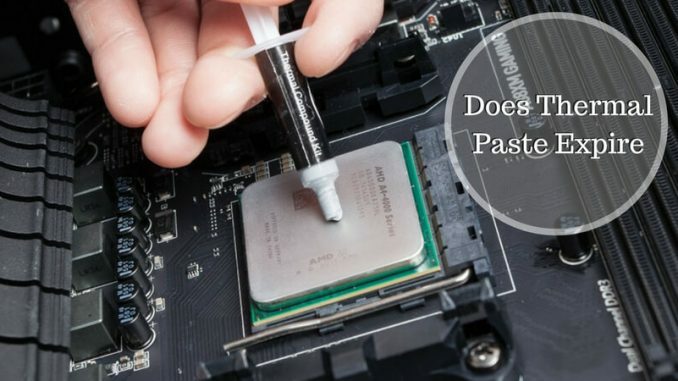 Today, I am going to answer about a confusion bothering some of you – Does thermal paste expire? Can thermal paste go bad? Read this article and get the exact answer. As you all know that the thermal paste (A.K.A. thermal grease) is a cooling agent, which is sticky by nature. It helps in preventing overheating of the CPU. This substance needs a caring hand while applying to the plate. If you use it in the wrong manner, you can even lose the whole system. So, here we should understand that it is not necessary that always there is a problem with the paste. Many of the times, wrong application of the thermal paste can become the primary system to crash down the system, and the paste got the whole blame. Thermal Paste is sticky greasy material. The compound normally does not get hard and it can stay sticky for years. But, there are a lot of other factors which may affect the final product of thermal paste. It depending on the solvents used in the making of the compound which may dry over the years, and not the thermal paste. If that so, still you don’t need to worry. This is not a reason to get stressed as the paste is still going to do its job, even when the inner substances are dry! So, there is no reason to replace the dried thermal compound. To confirm the information I’ve found on the internet, I did an email to the customer care center of Arctic Silver. In reply, they gave a green signal to use old thermal pastes. The professionals suggest that as far as the mixture is thoroughly compound, it can be used undoubtedly. As we have discussed, it is safe to use old thermal paste. But, still, you should take a bit more care to apply such types of thermal pastes. For that, first of all, squeeze out a small amount of mixture on paper and throw it away. That is not needed as it might be the clear fluid which is not the useful thermal paste. Then, squeeze again until the silver colored substance come out, which is the actual paste you can use for your CPU. Read the full instruction of how to apply thermal paste, and start the process slowly so that you don’t end up by applying more than required thermal paste. Here, we all should keep in mind that all the processors and systems are different, and so; some of them may require the modified method of application and best thermal paste like Arctic Silver. So, from now onwards, when you or your expert friends have confusions like; can thermal paste go bad? Then give reference to this article and get the exact answer.